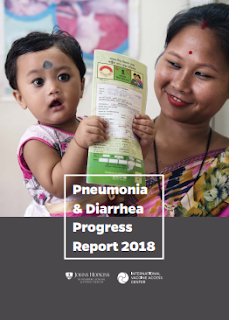 A just-released study, “The Pneumonia and Diarrhea Progress Report 2018”, prepared by the International Vaccine Access Centre (IVAC) at the Johns Hopkins Bloomberg School of Public Health, has identified India among 15 other countries which are still far off the mark in achieving the targets of the Global Action Plan for the Prevention of Pneumonia and Diarrhea (GAPPD). Set by the World Health Organization (WHO) and the United Nations International Children’s Emergency Fund (UNICEF), to be achieved by 2025, GAPPD is as an integrated approach to reduce the incidence of severe pneumonia and diarrhoea, and reduce the number of children under-five who are stunted, and end preventable childhood deaths from pneumonia and diarrhoea. 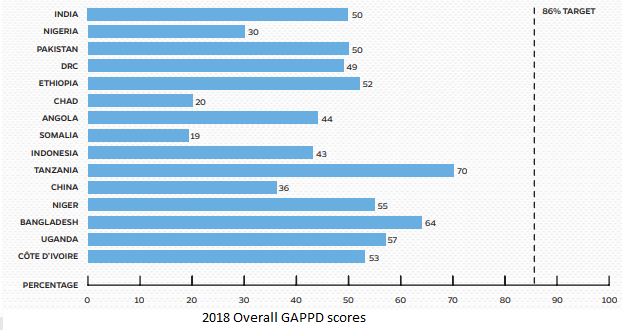 Calculated by averaging the indicator-specific target scores of all 10 indicators identified in GAPPD, the study finds that, as against the target of 86% coverage for various steps needed to be taken to be taken to achieve the GAPPD, India is just half way, 50%, which is equal to Pakistan but much below Bangladesh’s score of 64%. The study focuses the world’s 15 countries with the highest number of pneumonia and diarrhea child deaths: India, Nigeria, Pakistan, the Democratic Republic of Congo (DRC), Ethiopia, Chad, Angola, Somalia, Indonesia, Tanzania, China, Niger, Bangladesh, Uganda, and Côte d’Ivoire. 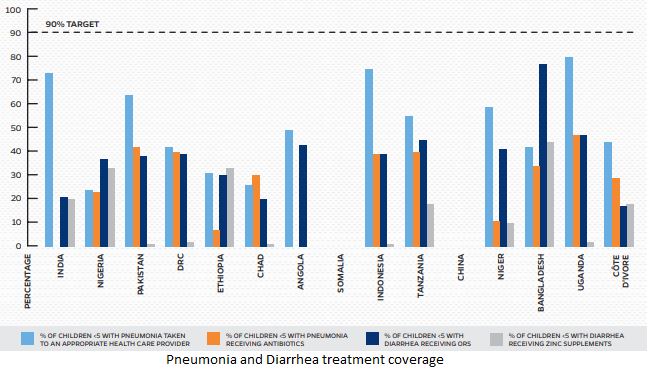 India’s pneumonia prevention score is 65% as against the WHO-UNICEF target of 84% and diarrhea prevention score is 39% as against the target of 82%. Here, while Pakistan performs worse than India (63% and 33% respectively), Bangladesh scores much better (74% and 54% respectively). Its GAPPD score is based on 10 major indicators -- exclusive breastfeeding of infants 0–5 months, 3rd dose of diphtheria-tetanus-pertussis vaccine (DTP3), 1st dose of measles-containing vaccine Hib3 (MCV1), 3rd dose of haemophilus influenzae type b (Hib) vaccine, 3rd dose of pneumococcal conjugate vaccine (PCV3), final dose of rotavirus vaccine (RotaC), children with acute respiratory infection (ARI) taken to a health facility, children under 5 with symptoms of ARI who received antibiotics, children under 5 with diarrhea receiving oral rehydration salts (ORS), and children with diarrhea who received zinc supplements. India’s death rate among children under 5 (per 1000 live births) is 6.3 (pneumonia) and 4.1 (diarrhea). It is much higher in Pakistan, at 11.5 and 6.8 respectively, but it is lower in Bangladesh, at 5.5 and 2.3 per 1000 live births respectively. 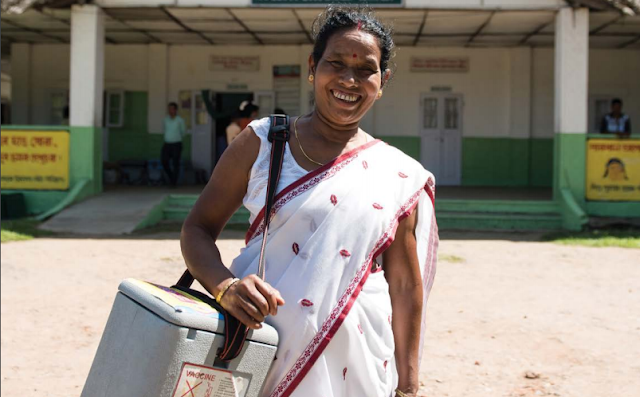 In India, health issues are not addressed to as quickly as it requires.quires either by the govt or by the people.